The longest tributary of the Rhine rises in the Vosges, forms the border between Luxembourg and Germany for a while, and then meanders leisurely in a deeply cut valley through the wooded low mountain ranges of the Eifel and Hunsrück. 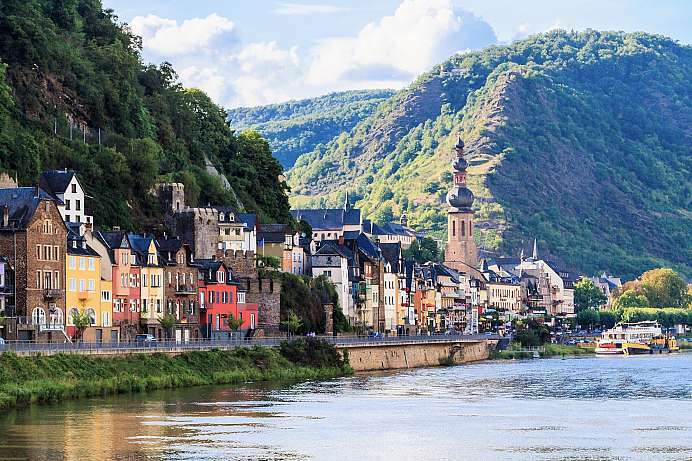 The section between Bernkastel and Cochem is considered to be the most beautiful, because here one still finds what can only be sensed in the industrialized Rhine Valley: the romance of an ancient cultural landscape. Villages and towns, where time seems to have stood still, lie in the shadow of mysterious castle ruins and are surrounded by vineyards that generations of winegrowers have wrested from the steep slopes of the valley. Along the Moselle there are wonderful hiking trails (marked by an “M”), sometimes at altitude through forests or medieval villages, sometimes through vineyards or quiet side valleys. In some places the path follows the Via Ausonia, a Roman trade route. The tiny village of 140 inhabitants was a city in the high Middle Ages, before it sank into insignificance during the French era at the end of the 17th century and time stood still. Construction activities came to a standstill, which is why Beilstein today has one of the best preserved historic sites on the Mosel. The place, which is also called miniature Rothenburg or ‘Sleeping Beauty of the Mosel’, is dominated by the ruins of castle Metternich, which once belonged to the royal dynasty of the same name. 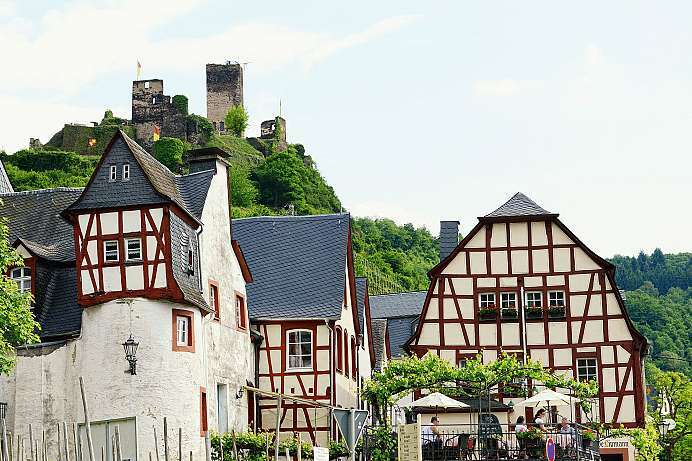 In July and August of each year, the Beilstein fairytale summer takes place, at which the Puppet Theater from Cochem performs fairy tales in the viticulture museum. 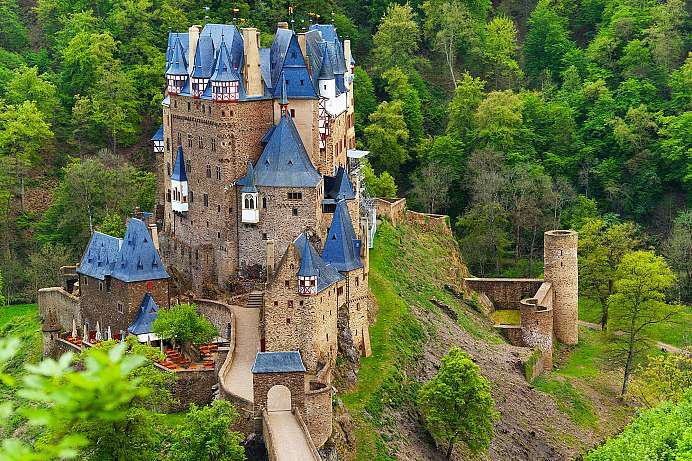 Tucked away in the dense forest of the River Elz Valley, Burg Elz is considered the prototype of a German castle. It was never found by the troops of Napoleon, so it wasn't destroyed. In 1268 it was divided among three descendants who had to live together in the narrow castle. Each line built its own tract over the centuries and added countless turrets, bay windows and other elements. Guided tours are offered. You can access the castle on foot from Moselkern or from the parking area above Müden, or by car via Münstermaifeld and Wierschem. The village is situated at the end of the Cochemer Krampen, a 20 kilometre long Moselle arch, which is considered to be the most beautiful section of the Moselle. Like many places there, Cochem was already populated by the Romans and Celts. Large parts of the old town were destroyed in the Second World War, but in the meantime Cochem presents itself as a lively small town with rich historical buildings and romantic squares and alleys. Important buildings of the medieval city fortification are still preserved. Historical half-timbered houses can be found above all at the market with its fountain and the baroque town hall as well as in the side streets. Today the Cochem Cultural Centre resides in the Capuchin monastery from 1623. With a total length of 365 kilometres, the Moselsteig is one of the longest long-distance hiking trails in Germany. It follows along the Moselle in 24 daily stages from the German-French-Luxembourg border to its estuary in the Rhine at the “Deutsche Eck” in Koblenz. 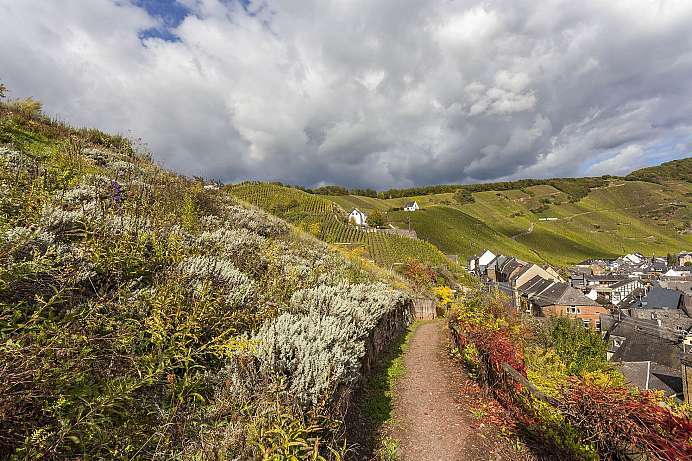 The Moselsteig is extremely diverse: Sometimes it leads through woods, sometimes through vineyards, sometimes along the banks of the Moselle, but also through quiet side valleys or over scenic hillsides. In between, you will pass ruined castles and ancient villages where time has stood still. If you only want to walk one day, you can take the train and bus back to the starting point after the hike. 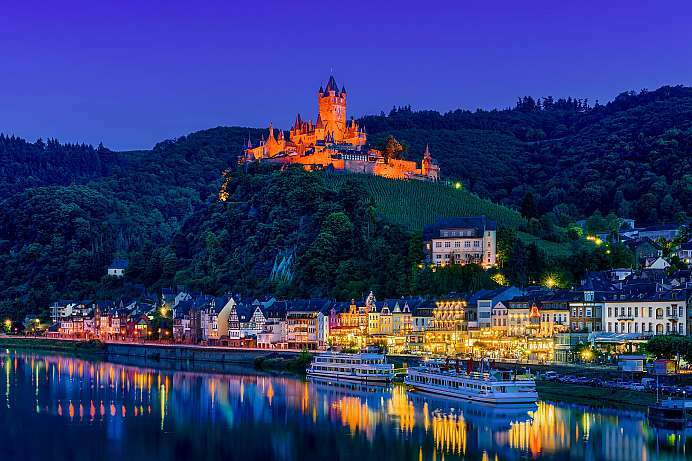 High above Cochem rises the largest hilltop castle on the Moselle. Situated on mighty rock, the Reichsburg with its bay windows and pinnacles is a majestic sight. The medieval castle belonged to the Electors of Trier when it was destroyed by the troops of King Louis XIV in the War of the Palatinate Succession. In the 19th century, Louis Ravené, the equally rich and crazy Berlin commercial councillor, had the ruins restored in neo-Gothic style. Guided tours through the impressive interiors are offered. Besides on Fridays and Saturdays rustic knight meals are offered. The so-called “Gasterey nach Art der alten Rittersleut” is a convivial evening with a four-hour programme. 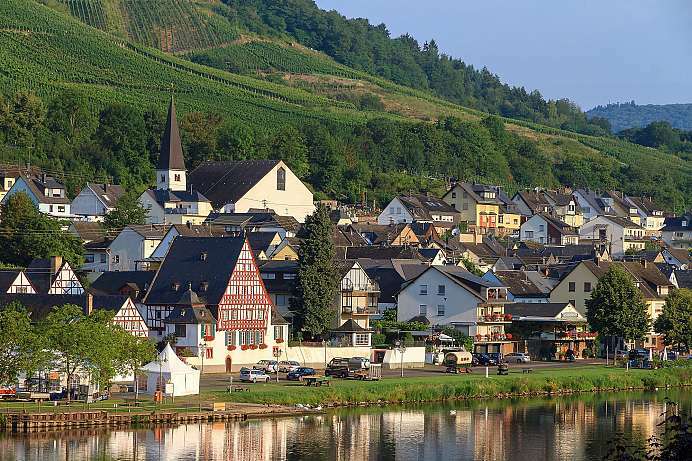 The town between Trier and Koblenz is the second largest wine growing region on the Moselle. Everywhere in the town wine tasting is offered. Traditionally, mainly Riesling is grown. Nationally known is the Zeller Schwarze Katz (“black cat”). The name of Zell's large vineyard comes from a legend, according to which a black cat has revealed to a wine merchant, in which barrel the best wine was stored. Similar stories and much more can be found in the wine and local history museum, which begins with excavations of the Romans.